All you need is faith, trust and a little bit of fairy dust to win big and discover the secrets of the forest. Secrets of the Forest online play slots, will transport you to the tranquil magical forest in a fairytale land that will leave you feeling completely enchanted. Your curiosity and inquisitiveness will pay off in this game as you unlock the secrets of the forest and make some fluttering fairy friends along the way. In the enchanted forest, you will meet a trio of cheeky fairies that will dance across the reels and hopefully will cast their magic spells in your favour and bestow you with some generous prizes. 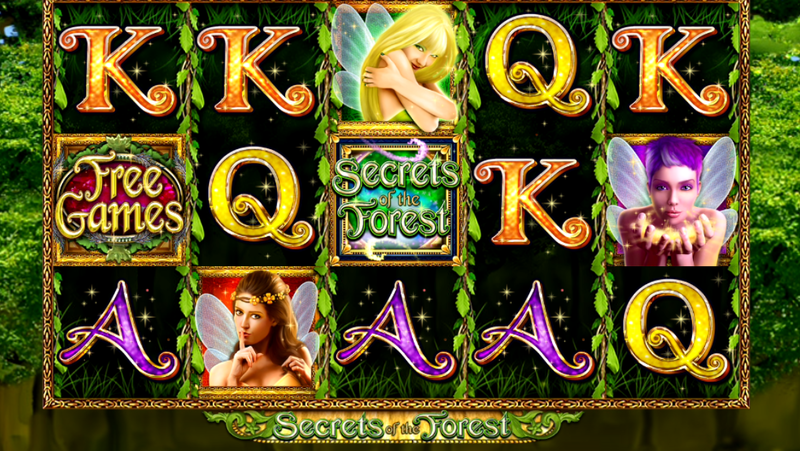 Secrets of the Forest is a magical themed slot game that has a traditional layout of 5 reels and 3 rows which is played across a maximum of 99 potential paylines. The potential to play across 99 paylines makes it a great game for experienced players who are confident in placing higher bets for the chance to reap some fantastic rewards. Keep your eyes peeled for the Wild symbol throughout the game as well as the Tumbling Reels feature and the Free Games feature. These bonus features will help you along the way to riches if you are not inclined to dig deep into your pockets to play across all 99 paylines. It’s hard to tell if the mischievous pixies are on your side or not, as they leave a trail of letters which could potentially point you to the three fairies or they could just be leading you a merry dance and giggling at your expense. You’ll be rewarded with up to 1,000 coins if you find the fairies on the reels so keep trying and while you’re at it be on the lookout for the Secrets of the Forest symbol which will unlock a fantastic prize of up to 5,000 coins. Delve deep into the magical forest and hunt out the Free Game symbol and if you land this lucrative symbol on the first 3 reels in a row you will be rewarded up to 4 free games. Magic and enchanting forest settings have been a favoured backdrop to slot games since day dot, but Secrets of the Forest excels itself and sets a benchmark for all other magic, fairy themed slots to follow. This wonderfully whimsical slot game will have you bewitched with its cute soundtrack and stunning graphics and both novices and experienced slot will enjoy this entertaining game. Not only is this game a pleasure to look at, but the bonus features keep you on your toes, creating plenty of magical paths to explore and earn some dosh. Find out more games like Secrets Of The Forest!